I have been doing the sketches all week over at the Stampin' out Alzheimer's site. This one is for the Gina K sketch. I have to admit this one had me stumped for awhile! What helped was we were to make it for a loved one or remembering someone. 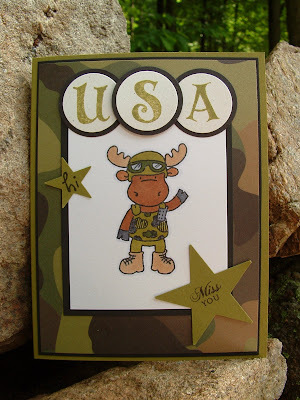 I deceided that I wanted to make a card for my nephew who is serving over in Iraq right now. Once I deceided that the rest fell into place. I used GI Jon Riley, I hope it will fring a smile to his face! Oh this is a FANTASTIC card! I love it, and it's just perfect for your nephew! What a great card, Janice!!! I love it! Love it, he makes me giggle! !